Even though the Clocktower Gallery has been around since 1972, you might never have known it was even there. It resides in the top two floors of a government-owned building in Tribeca, which is just part of the odd story of how this alternative art space has operated through the years. Now it is hosting its final show, Dale Henry: The Artist Who Left New York, before the space is cleared for a luxury apartment. The creator of the Clocktower Gallery, Alanna Heiss, is a leader in the alternative art space movement. It all started in 1971 when she founded the Institute for Art and Urban Resources Inc. based out of the exhibition space of PS1. This organization was dedicated to utilizing unorthodox and otherwise unused spaces in New York City as places to host exhibitions and residencies for artists. Once the ball got rolling, Heiss opened up a series of spaces. In 1972 she opened Clocktower Gallery on the top floor of the Clock Tower Office Building in Tribecca. The building along with the clock tower above it was built in 1898, and since then has been bought and landmarked by New York City. When Heiss moved in, the clock above the building didn't work at all, though you were able to visit and exhibit in it like any other room in the gallery. In 1979 a man named Marvin Schneider asked the city if he could fix the clock for them. Once he got the OK, he had the clock up and running in a month. Over the course of the following year, he fixed up the space and made sure the clock was running in tip-top shape. The Clocktower Gallery now had a working clock to visit. The Clocktower Gallery and PS1 operated solely under Heiss until the year 2000, when MoMA stepped in and became an affiliate of the two spaces. From that point until September 11, 2001, the gallery and the clock above it functioned as they had since 1979. After the attacks, however, a reorganization of the city's municipal structure and an intensification of security protocols at the criminal court, located in the same building, made the clock off limits to casual visitors due to its landmarked status. The gallery below would continue to host artist exhibitions and residencies, but the clock above was reserved for only the the clock master and special guests. It was off-limits and out of sight for everyday New Yorkers. 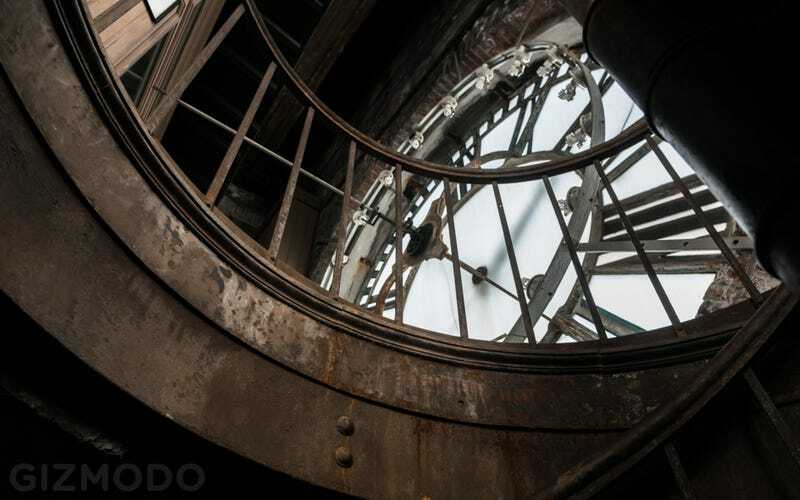 Gizmodo was lucky enough to get inside the clock tower and explore this extraordinary artifact last week. Marvin—now the city's official Clock Master—and his assistant, Forrest Merkowitz, showed me inside. The Clocktower Gallery itself has been open to the public all along, even while its namesake remained locked behind closed doors. In 2004, hoping to expand the range of the gallery's influence and audience, Heiss founded WPS1, an internet radio station operating from within the Clock Tower building. WPS1 was the world's first internet art radio station, providing some of the best 24-hour art-themed programming you could find on the air. When Heiss later left PS1 in 2008, she negotiated with MoMA to keep the radio station as her own. The radio station continued under a new title—Art International Radio—still in possession of all the archives from WPS1. Heiss also broke the Clocktower Gallery's affiliation with MoMA, as the gallery would from then on be run by Art on AIR, a new organization she was starting as a partnership with the station. After the gallery was transferred to Art on AIR, Heiss revamped the gallery and its residencies, and increased the production of the radio station, tripling its audience in the process. 40 years after its opening, the Clocktower Gallery is now leaving its extraordinary space. The city decided to sell the floor out from under them to develop a beautiful studio apartment for a lucky 1%-er. Starting next month, however, in December 2013, the gallery will live on, headquartered in Neuhouse, a space on 25th street in Manhattan. From there it plans to host a series of collaborations throughout the city, the first of which will be over in Red Hook at Pioneer Works, the Center for Art and Innovation, with a continuation of the current exhibition, Dale Henry. Then, in 2014, the Clocktower will move into Pioneer Works for a full year, while Heiss, as Curatorial Advisor, will focus on Knockdown Center. Knockdown Center is a new alternative art space in Queens planned to open next year.